My sweet baby boy is now one month old. In that one month, he’s put on an impressive four pounds of adorable baby chub. 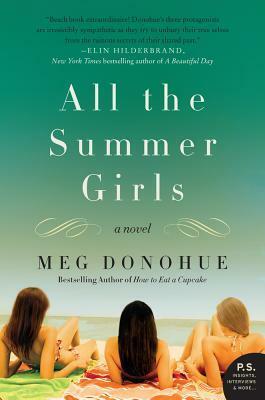 While he guzzled sipped politely all the way to twelve pounds, I finished seven books. I suppose seven books in a month isn’t terribly impressive – unless I’m in a true reading slump, I usually polish off about ten. But the last few months of my pregnancy weren’t exactly ideal for reading. There was travel, there were after work appointments and weekend errands. I was making a series of very stressful decisions, packing, moving, spending a lot of money, and oh, not sleeping. Did I mention that? Shortly after finishing this post, my sleep took a real dive. I wasn’t adhering to my usual granny-like bedtime (too keyed up+busy) and between incessantly sore hips, peeing, and heartburn (if I didn’t quit eating by 7:30 p.m.) or hunger (if I did quit eating by 7:30 p.m.), I was up half the damn night. The sun would come up around 5 a.m. and I’d just throw in the towel. It was really sad. Now, everyone is asking me how the baby is sleeping and how I am sleeping, and I have to say, just being tired, falling asleep, and staying asleep for the 2.5 hours between feedings is GREAT. Nearly luxurious. Anyway, my usual reading times were pretty much all foiled. Early a.m. reading over coffee? I was usually too grumpy to want to open a book. Reading lunches? Too busy running errands or writing book reviews. Audiobooks while commuting? My brain just couldn’t sit for very long. My time and my brain weren’t in the right place; in fact, I was starting to feel like reading was a bit of a chore. AND NOW, I’ve read seven books. Mostly while nursing. Congratulations to me. From what I’ve heard from friends, this period of SUPER READING! only lasts about as long as your child is still immobile with a tiny stomach. Which isn’t actually all that long. I should MAXIMIZE and PRIORITIZE my reading to make sure I make the most of this brief window! Oh, or maybe I’ll just read a truly random smattering of who knows what. And then write a way too long blog post about them all. I’m on maternity leave; I do what I want. I don’t even know if this counts as a book. It was so very short, and I’m just now noticing that the print version includes two other similarly brief pieces. I definitely just read the one. 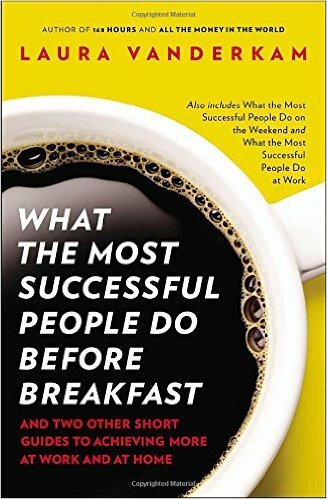 So what do successful people do before breakfast? Do they toss and turn for hours, heaving a giant pregnant belly around the bed and weeping in exhaustion? Do they nurse small children at 2 a.m. while checking Instagram and eating chocolate covered candy bars granola bars? No. They don’t. They do exactly what you think they do, if you’ve ever read a similar productivity article. Spoiler alert: they stay off the Internet, they attend to their personal projects and highest values, and they exercise. Still an interesting little read, if you are the kind of person who likes to unsurprising productivity articles (I definitely am). I do remain skeptical of anyone who does any of this stuff before breakfast. If I’m still in bed, there is definitely a bowl of cereal and a cup of coffee standing between me and any of my higher values. Hey, did I ever tell you that I got a new Kindle? I can’t remember and I don’t feel like looking through my archives. Well, I did. I decided I wanted a new, black and white Kindle to see if I could finally coerce myself into reading eBooks. I don’t know why this feels so important. I have so many paper books in my life that need to be read. I think it’s probably a Edelweiss/Netgalley related desire, even though the lousy formatting on egalleys still drives me bonkers. 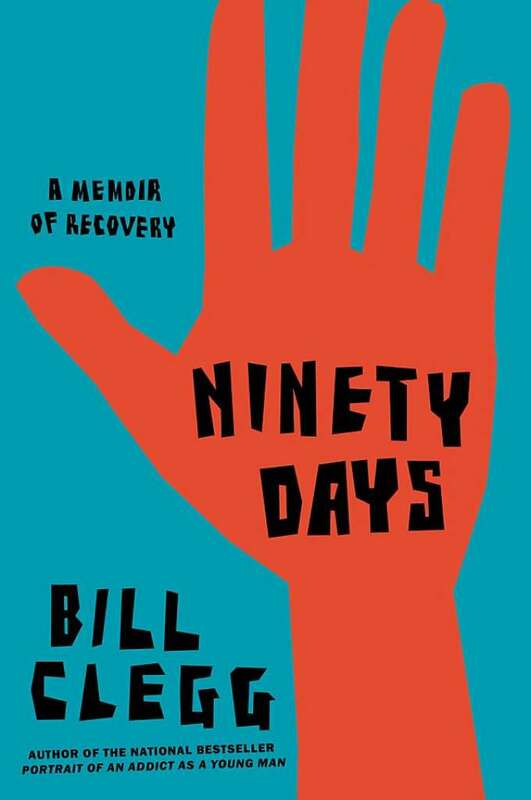 Anyway, I found the Vanderkam and this here run-of-the-mill drug addiction memoir while looking for “Available Now” titles on Overdrive: this book browsing tactic usually leads me to popular/mid-list titles published 1-4 years ago that I never got around to reading. I enjoyed Clegg’s Portrait of an Addict as a Young Man, and I also enjoyed this follow-up. Because I like reading addiction memoirs, not because it was particularly spectacular. Enter: the Mommy Books! This is a Mommy Blog now, right? The Waldman was another Overdrive “Available Now!” selection; the Enright was part of a stack of library books I’d checked out whilst quite pregnant to try to coerce myself into getting some reading done. I liked the Enright more than the Waldman; both are collections of personal essays, but Enright’s are quieter – more about the feeling and experience of motherhood, both personal and universal. Waldman’s are more about the public experience of motherhood – how society treats mothers and leads mothers to treat themselves/their children – but also about Waldman herself, but in a more autobiographical sense. 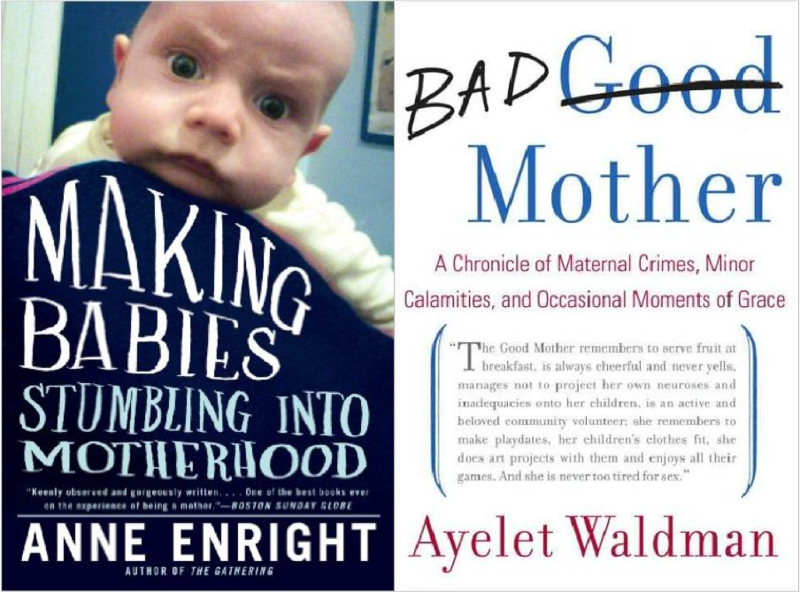 Enright’s stories were about small moments in the daily endeavor of childbearing and childrearing; Waldman’s about how she met her husband and that time she wrote an incendiary article about motherhood and all of the associated outrage. I think I’m more into the Enright-type writing at this snuggly baby point in my mother-dom. Plenty of time for outrage later. When I went into labor two weeks early, I left a truly staggering to-do list in my wake. Looking back, really far too much stuff to have actually been able to accomplish in two weeks… live and learn, I suppose. Anyway, Fantasy Dream Jessica was planning on finishing all of her outstanding professional reviews before giving birth. Actual Early Labor Jessica ended up with a handful of unfinished reviews, and two books that still needed to be read. 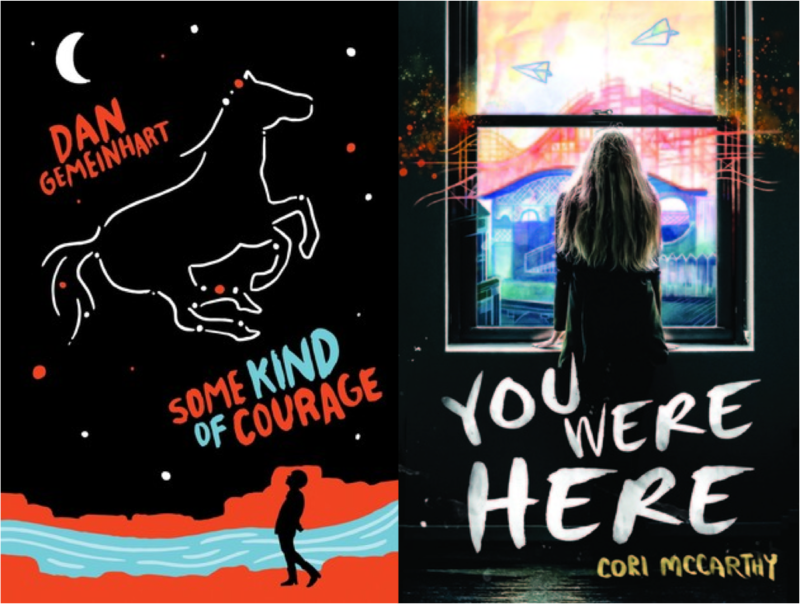 You Were Here: a YA book with multiple POVs, illustrations, and a good cover that doesn’t quite transcend the “A Tragic Death Has Left Me Soul-Tortured! Please Help!” trope. Some Kind of Courage: a middle grade Western that adheres to the Dangerous Situation -> Just-in-time Save -> Another Dangerous Situation -> Another Save! school of adventure plots.